The Graphics cards segment has been dominated by NVIDIA for quite some time. We were on the fringe of seeing an all out war break out between the two rivals after AMD’s VEGA launch. Unfortunately, VEGA didn’t make the cut and it seems we’ll be left with incremental upgrades for the coming year(s). There’s a bit of uncertainty over the number of years before we see some real competition. And for now, it seems to be rooted around one man – Raja Koduri. The erstwhile head of the Radeon Technologies Group which brought out Radeon VEGA has left AMD and joined Intel. With a new technology group under his guidance, Intel is now planning to come out with discrete graphics solutions. These things take time so perhaps we might see some interesting developments from the Blue camp in about two or three years. Till then, we’re stuck with the Green camp who’ve delivered a really powerful architecture in Pascal after Maxwell. And now it seems NVIDIA might not release Volta anytime soon, instead they’re coming out with Ampere which is geared for the consumer market. Let’s look at this year’s contenders. The Titan Xp might be NVIDIA’s most powerful graphics card but it’s more of a compute card rather than a gaming card which is why we don’t see board partners coming out with Titan Xp SKUs. So the next best thing is the GTX 1080 Ti. Among all the GTX 1080 Ti(s)that we received this year, the ZOTAC GTX 1080 Ti AMP! Extreme is this year’s best performer. It’s a 3-slot graphics card with a triple fan cooler that’s built to ensure cool operation and has the thermal headroom should you further overclock the already factory-overclocked graphics card. Its got a 3DMark Firestrike score of 23371 which is the highest we’ve seen from any GTX 1080 Ti. NVIDIA’s reference card clocks in at around 22800. 4K gaming at 60 FPS is the norm when you pack a GTX 1080 Ti. Even a poorly optimised title like PUBG when played on Ultra setting at 4K resolution gives 40-45 FPS and that is quite impressive. With a lower clock speed than the ZOTAC card, the Inno3D iChill GTX 1080 Ti Ultra X4 comes in at a close second. The synthetic benchmarks are what set the two apart, but when you look at real world gaming performance, then they are very similar. The iChill card has a unique cooler unlike any we’ve seen so far where they’ve added an intake fan on the top side of the graphics card. It’s a weird setup that you can check out later in our detailed review. For now, it remains the second best graphics card we’ve tested. AMD refreshed their entire Polaris lineup early this year with the RX 500 series. However, their RX 580 and RX 480 units have been extremely hard to come by thanks to cryptocurrency miners who’ve wiped the aisles clean. 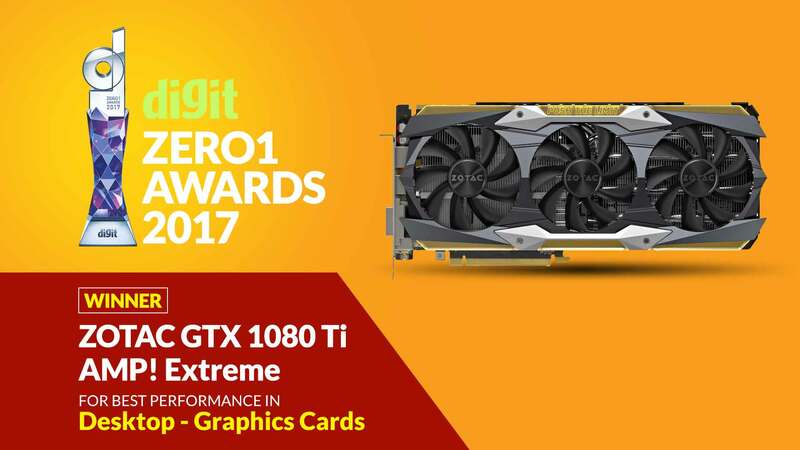 The same can be said of the GTX 1060 series from NVIDIA. Speaking of NVIDIA, they didn’t have any mid-range launches this year. And since the law of diminishing returns makes the 1070 Ti pale in comparison to the RX 580 in terms of value for money, we picked the RX 580 as the best buy among all the cards released this year. Digit.in (formerly known as thinkdigit.com) is one of the most popular technology portals in India, visited by 5.7 million visitors every month, collectively leading to about 21.3 million page views every month. The portal offers product reviews, comparisons, buying advice, opinions, industry insights, interviews, downloads and more. Our editorial team spawns discussions across our forum and social media channels to create the largest and most engaged community of technology consumers and enthusiasts in India.